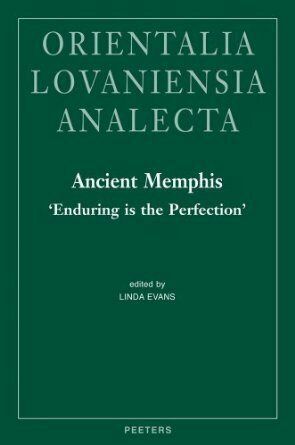 This volume represents papers from the Australian conference Memphis in the First Two Millennia, the results of a five year project to examine socio-political and cultural changes during the development of Egypt’s government, focusing on the ancient city of Memphis. The papers cover a wide range of topics and periods, including Early Dynastic tombs at Helwan, images of metallurgy in Old Kingdom Memphite tombs, a study of Senusret III’s North Chapel at Dahshur, Hathor’s cult in Memphis, and the Memphite perspective on the major gods of New Kingdom Egypt. David Jeffreys summarises the results of the EES Memphis survey to date, including the geographical modelling of Nile movements, giving a more accurate location for the earliest city itself and also discusses the dilemmas of heritage conservation in an increasing urbanisation of land. Yvonne Harpur describes the Oxford Expedition to Egypt project to create a database of tomb scene details and includes some of the stunning black and white photographs taken in Old Kingdom tombs at Saqqara; and in the intriguingly titled Butcher Queens of the Fourth and Fifth Dynasties, Lesley J.
Kinney discusses the meaning behind an unusual title held by several Old Kingdom queens and concludes that it may have allowed them to oversee the funerary rites of their deceased husbands. Other contributors include Miroslav Bárta, Naguib Kanawati and Alain Zivie, whose paper on Amenhotep III is presented in French. Well-illustrated throughout with black-and-white photographs, drawings and diagrams and with useful bibliographies for each paper, this volume gives a fascinating overview of Egypt’s first capital city and its importance in the development of Egyptian civilisation. Maya was one of the most important officials of the late Amarna Period, serving Tutankhamun, Ay and Horemheb as Overseer of the Treasury. Geoffrey Martin and his team began their work to rediscover his tomb back in 1975, but their discovery of the Saqqara tomb of Horemheb delayed their original mission until 1986, when the first part of Maya’s tomb was found. Volume II of the EES excavation report was published more than ten years ago, covering objects and skeletal remains from the tomb; this volume records the stunning reliefs in a large format book with fold-out pages that allows full details of scenes and fragments to be reproduced. More than 130 plates record the tomb structure and scene details in black-and-white photographs and line drawings. 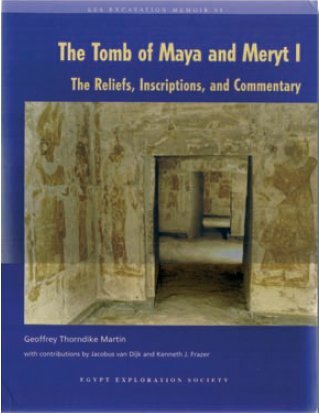 The illustrations include a series of photographs of the statues of Maya and his wife Meryt now in the Leiden Museum, and end with four colour photographs of the reconstructed rooms of the substructure. Accompanying the plates are chapters covering topics that include architecture, scene descriptions, text translations and a “biographical sketch” of Maya by Jacobus van Dijk of the Leiden Museum, detailing Maya’s responsibilities. These included supervising building work at Karnak and arranging the reburial of Akhenaten and Tiy in the Valley of the Kings. Van Dijk also discusses new evidence that equates Maya to the courtier May, suggesting a career that may have begun in the reign of Akhenaten. Pat Brown is not a typical Egyptologist or historian. 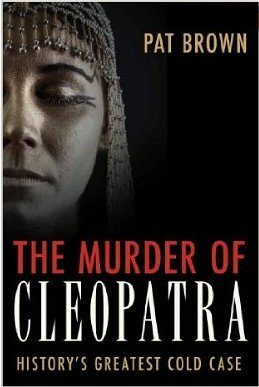 She is a well-known American criminal profiler who, having been approached to present a television programme on the death of Cleopatra, became so intrigued by the subject that, several years later, she produced this book. Her title is something of a give-away: rejecting the traditional view, promoted by the Classical authors, that Cleopatra committed suicide, she believes that Cleopatra was murdered. She sets out to prove her case employing (as far as the vast time-gap allows) the same techniques that she would use to investigate a more modern murder-mystery. As we might expect from this background, this is not a conventional history of Cleopatra. Nor does it pretend to be. It is essentially the story of the author’s developing fascination with her subject, and with Egypt both ancient and modern, and it is written in a non-scholarly, highly enthusiastic style which makes it accessible to those unfamiliar with late Ptolemaic history. A set of rather random photographs accompany this quest: I particularly enjoyed “The Great Pyramid through the window of the nearby Pizza Hut” (the pyramid in question actually being Khafra’s). The reader may, or may not, agree with the author’s conclusions on the death of Cleopatra. However, the underlying theme of the book – is it ever possible to employ modern scientific techniques to ‘investigate’ the minds of the long dead – is a thought-provoking one which leads us to question our own relationship with the past. How often do we, either consciously or unconsciously, make assumptions about the thoughts and beliefs of the ancients? Joyce is the author of Cleopatra: Last Queen of Egypt published by Profile Books. Many people visit Egypt’s temples and admire the artwork without understanding the scenes before them, but this book will help even the most hieroglyph- phobic visitor to understand major temple scenes without the need to learn their Egyptian ABC. 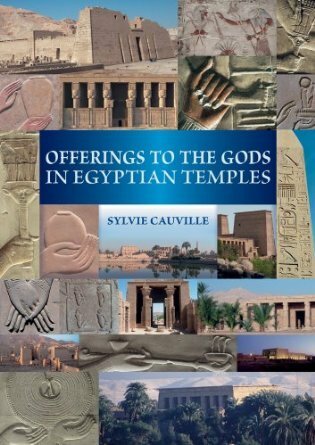 Translated from the original French version (also available) Cauville explains over two hundred offering scenes using photographs and diagrams, highlighting the key hieroglyphs to look out for, giving translations of the texts and explaining the context of the ritual and its depiction. For example, photographs taken at Dendera and Esna show the king presenting an offering of papyrus and geese; Cauville draws the key hieroglyph groups, explains the significance of papyrus as a Delta plant and its role in the story of Isis and Horus, gives translations of the accompanying text and puts the scene into historic context (this combination of offerings only appears during the Graeco-Roman period). The chapters are split into colour-coded categories such as “purification rituals”, “food offerings” and “offerings specific to the goddesses”, with an introduction explaining the concept of the temple in ancient Egypt and the principles behind offerings made between the king and the gods. We also discover that milk is the liquid symbol of rebirth which is offered in specific teated receptacles, the most beautiful example scene being in the hypostyle hall at Karnak, and that to guarantee their power, kings from the New Kingdom onwards offered to goddesses a vertical trunk containing magic scrolls protected by Thoth in the form of a baboon. Appendices cover more general topics such as royal rituals and the foundation of a temple, and an indexed list of Rameses II scenes from the southern exterior wall at Karnak to give readers an understanding of one sequence which is “all on one level, easy to see, and in a relatively calm environment”. 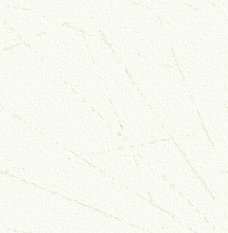 An indispensable guide to temple artwork that cries out for a pocket-book version or mobile app to make for more illuminating temple visits. Seth – A Misrepresented God in the Ancient Egyptian Pantheon? Because of his complex nature, Seth is a most difficult god to understand, and, as the title of this publication makes clear, he is often ‘misrepresented’ both in the literature and indeed in the minds of many people who have made a study of Egyptology. This publication attempts to set the record straight and puts the god Seth into his proper historical context by presenting a detailed discussion of the god and his development, making use of many Ancient Egyptian references and texts in the process. The author makes it clear that when considering Seth we have to look at both the historical development of his cult and also the inclusion of the ‘Myth of Osiris’, to see how the two coalesced to colour later Egyptian beliefs as the worship of Osiris gained greater acceptance. Thus he shows how Seth’s identity changed from that of a native, and necessary, member of the Egyptian pantheon to a god ostracised because of his ‘murder’ of Osiris. This latter, simplistic view of Seth is one we all too often adopt today and this publication goes a long way to readdress our assessment of Seth and provide us with a far more rounded view of the god. Once the author gets into his stride the arguments are presented in a well measured fashion. Seth’s perceived link with ‘foreign lands’ is also well discussed, as is his development in the Graeco-Roman period, both aspects of his character which are often overlooked or only treated in passing in other studies. 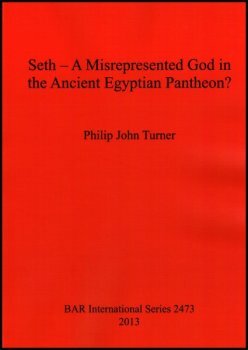 This publication provides a most useful addition for student of Egyptology, religion and mythology and readers will learn much from its arguments, not just about the god Seth but about the development of religious beliefs as well.